If you own a historic home, you understand how difficult it can be to optimize indoor comfort while also preserving the structure’s timeless beauty. We recently had the opportunity to update a beautiful Greek Revival townhouse built in 1846 by installing new, efficient windows that complemented the building’s historic appearance. The townhouse was completely renovated in the 1980s when it was divided into six condos. 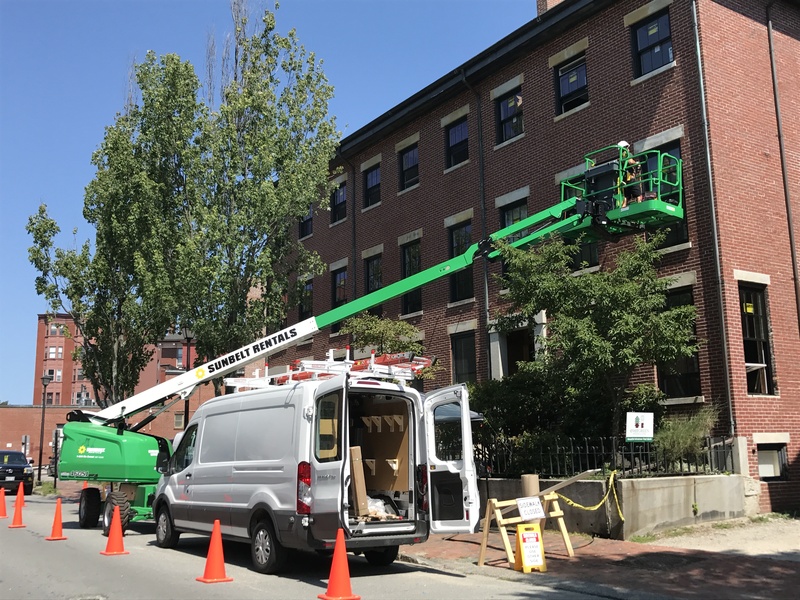 Though new double-hung windows were installed at the time of renovation, these windows quickly became a pain point for residents. The windows declined in functionality over time until the sashes could no longer be raised or lowered. Condensation began to form between the panes more and more frequently. The seals around the windows also became less effective, allowing cold drafts to seep in from outside during the cold Maine winters. Because the windows were so large, drafts and street noise were especially noticeable. The condo association and condo owners knew that it was time to invest in updated windows. Karen Foster and other fellow condo owners hired Evergreen a few years back to complete some insulation work in their townhouse. They were highly impressed with our work and heard that we also install high-efficiency windows and doors, so we were the first window specialist they called. They informed us that they were interested in replacing all of the front windows, as well as the side and rear windows. We quickly provided them with a quote and discussed their unique needs for the project, making sure we understood the individual requirements of each condo owner. It was important to select windows that would complement the historic style of the townhouse as the windows for the project needed to be approved by the city’s historic preservation board. Evergreen embraces the Marvin® lines of windows for their energy efficiency, quality of craftsmanship, and design. We helped Karen and the other condo owners choose a Marvin® style which would enhance home comfort and efficiency while also accenting the building’s unique design. Want to make your historic home in Maine more comfortable while preserving its unique design? Contact us or call (207) 594-2244 to schedule a consultation! Ready to see what Evergreen Windows & Doors can do for you? Nothing but good things to say. The guys that came and did the actual work were extremely nice and did a great job.